Water vapour feedback is simply written into climate models as parameters? ..Catastrophic predictions depend on accelerated forcings due to water vapour feedback. This water vapour feedback is simply written into climate models as parameters. It is not derived from any kind simulation of first principles in the General Circulation Model runs (GCMs)..
I’ve seen this article of faith a lot. If you frequent fantasy climate blogs where people learn first principles and modeling basics from comments by other equally well-educated commenters this is the kind of contribution you will be able to make after years of study. None of us knowed nothing, so we all sat around and teached each other. Actually how the atmospheric section of climate models work is pretty simple in principle. The atmosphere is divided up into a set of blocks (a grid) with each block having dimensions something like 200 km x 200km x 500m high. The values vary a lot and depend on the resolution of the model, this is just to give you an idea. Then each block has an E-W wind; a N-S wind; a vertical velocity; temperature; pressure; the concentrations of CO2, water vapor, methane; cloud fractions, and so on. Then the model “steps forward in time” and uses equations to calculate the new values of each item. The earth is spinning and conservation of momentum, heat, mass is applied to each block. The principles of radiation through each block in each direction apply via paramaterizations (note 1). Specifically on water vapor – the change in mass of water vapor in each block is calculated from the amount of water evaporated, the amount of water vapor condensed, and the amount of rainfall taking water out of the block. And from the movement of air via E-W, N-S and up/down winds. The final amount of water vapor in each time step affects the radiation emitted upwards and downwards. It’s more involved and you can read whole books on the subject. I doubt that anyone who has troubled themselves to read even one paper on climate modeling basics could reach the conclusion so firmly believed in fantasy climate blogs and repeated above. If you never need to provide evidence for your claims..
For this blog we do like to see proof of claims, so please take a read of Description of the NCAR Community Atmosphere Model (CAM 4.0) and just show where this water vapor feedback is written in. Or pick another climate model used by a climate modeling group. You can also find details of the shortwave and longwave radiation parameterization schemes and how they apply to water vapor. Essentially all GCMs yield water vapor feedback consistent with that which would result from holding relative humidity approximately fixed as climate changes. This is an emergent property of the simulated climate system; fixed relative humidity is not in any way built into the model physics, and the models offer ample means by which relative humidity could change. Water vapor is the dominant greenhouse gas, the most important gaseous source of infrared opacity in the atmosphere. As the concentrations of other greenhouse gases, particularly carbon dioxide, increase because of human activity, it is centrally important to predict how the water vapor distribution will be affected. To the extent that water vapor concentrations increase in a warmer world, the climatic effects of the other greenhouse gases will be amplified. Models of the Earth’s climate indicate that this is an important positive feedback that increases the sensitivity of surface temperatures to carbon dioxide by nearly a factor of two when considered in isolation from other feedbacks, and possibly by as much as a factor of three or more when interactions with other feedbacks are considered. Critics of this consensus have attempted to provide reasons why modeling results are overestimating the strength of this feedback.. Remember, just a few years of study at fantasy climate blogs can save an hour or more of reading papers on atmospheric physics. Note 1: The very accurate calculation of radiation transfer is done via line by line calculations but they are computationally very expensive and so a simpler approximation is used in GCMs. Of course there are many studies comparing parameterizations vs line by line calculations. One example is Radiative forcing by well-mixed greenhouse gases: Estimates from climate models in the Intergovernmental Panel on Climate Change (IPCC) Fourth Assessment Report (AR4), WD Collins et al, JGR (2006). This article will be a placeholder article to filter out a select group of people. The many people who arrive and confidently explain that atmospheric physics is fatally flawed (without the benefit of having read a textbook). They don’t think they are confused, in their minds they are helpfully explaining why the standard theory is wrong. There have been a lot of such people. Almost none of them ever provides an equation. If on rare occasions they do provide a random equation, they never explain what is wrong with the 65-year old equation of radiative transfer (explained by Nobel prize winner Subrahmanyan Chandrasekhar, see note 1) which is derived from fundamental physics. Or an explanation for why observation matches the standard theory. 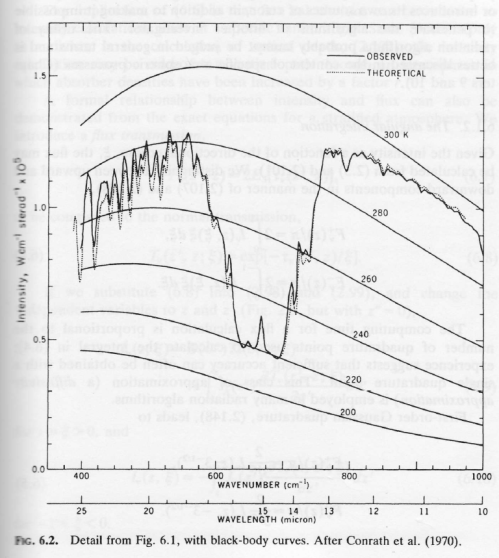 For example (and I have lots of others), here is a graph produced nearly 50 years ago (referenced almost 30 years ago) of the observed spectrum at the top of atmosphere vs the calculated spectrum from the standard theory. Why is it so accurate? If it was me, and I thought the theory was wrong, I would read a textbook and try and explain why the textbook was wrong. But I’m old school and generally expect physics textbooks to be correct, short of some major revolution. Conventionally, when you “prove” textbook theory wrong you are expected to explain why everyone got it wrong before. There is a simple reason why our many confident visitors never do that. They don’t know anything about the basic theory. Entertaining as that is, and I’ll be the first to admit that it has been highly entertaining, it’s time to prune comments from overconfident and confused visitors. I am not trying to push away people with questions. If you have questions please ask. This article is just intended to limit the tsunami of comments from visitors with their overconfident non-textbook understanding of physics – that have often dominated comment threads. So here are my two questions for the many visitors with huge confidence in their physics knowledge. Dodging isn’t an option. You can say “not correct” and explain your alternative formulation with evidence, but you can’t dodge. 1. Is the equation of radiative transfer correct or not? Of course (and I’m sure I don’t even need to spell it out) we need to integrate across all wavelengths, λ, to get the flux value. 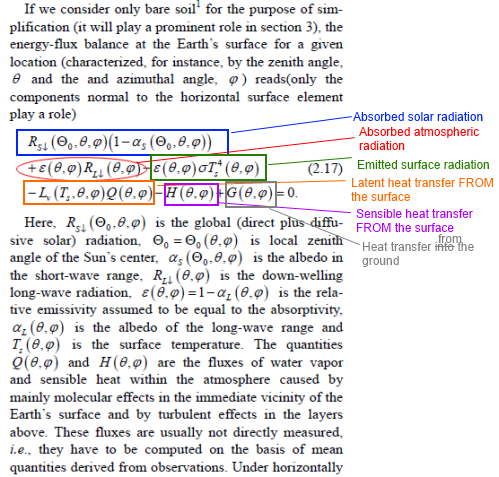 For the derivation see Understanding Atmospheric Radiation and the “Greenhouse” Effect – Part Six – The Equations. If you don’t agree it is correct then explain why. [Note that other articles explain the basics. For example – The “Greenhouse” Effect Explained in Simple Terms, which has many links to other in depth articles]. If you don’t understand the equation you don’t understand the core of radiative atmospheric physics. 2. 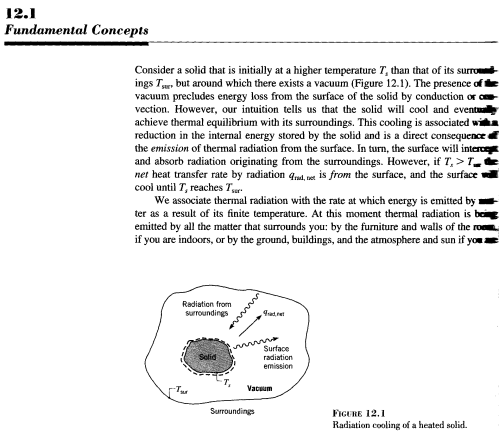 Is this graphic with explanation from an undergraduate heat transfer textbook (Fundamentals of Heat and Mass Transfer, 6th edition, Incropera and DeWitt 2007) correct or not? You can see that radiation is emitted from a hot surface and absorbed by a cool surface. And that radiation is emitted from a cool surface and absorbed by a hot surface. 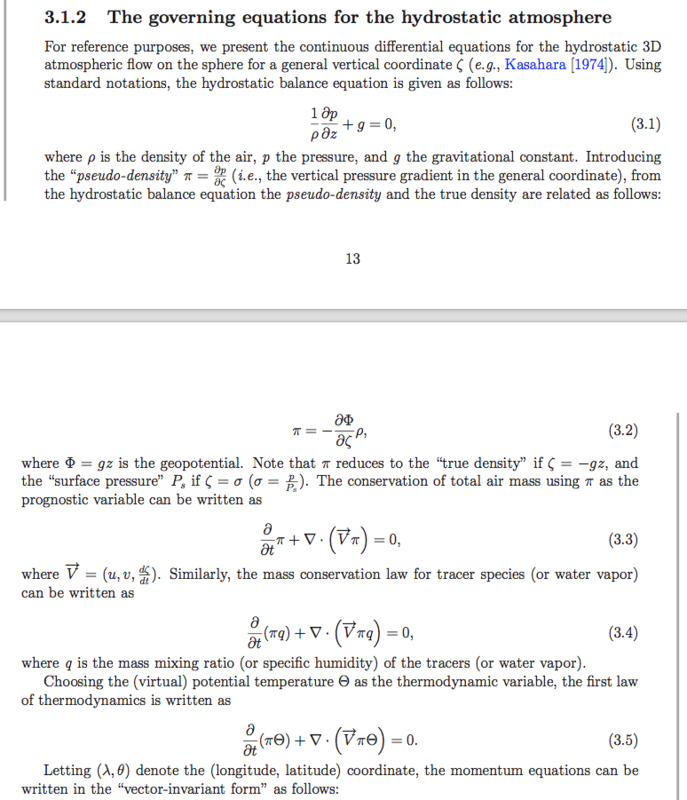 More examples of this principle, including equations, in Amazing Things we Find in Textbooks – The Real Second Law of Thermodynamics – scanned pages from six undergraduate heat transfer textbooks (seven textbooks if we include the one added in comments after entertaining commenter Bryan suggested the first six were “cherry-picked” and offered his preferred textbook which had exactly the same equations). What I will be doing for the subset of new visitors with their amazing and confident insights is to send them to this article and ask for answers. In the past I have never been able to get a single member of this group to commit. The reason why is obvious. But – if you don’t answer, your comments may never be published. Once again, this is not designed to stop regular visitors asking questions. Most people interested in climate don’t understand equations, calculus, radiative physics or thermodynamics – and that is totally fine. Call it censorship if it makes you sleep better at night. Note 1 – I believe the theory is older than Chandrasekhar but I don’t have older references. It derives from basic emission (Planck), absorption (Beer Lambert) and the first law of thermodynamics. Chandrasekhar published this in his 1952 book Radiative Transfer (the link is the 1960 reprint). This isn’t the “argument from authority”, I’m just pointing out that the theory has been long established. Punters are welcome to try and prove it wrong, just no one ever does. Long before the printing of money, golden eggs were the only currency. In a deep cave, goose Day-Lewis, the last of the gold-laying geese, was still at work. Day-Lewis lived in the country known affectionately as Utopia. Every day, Day-Lewis laid 10 perfect golden eggs, and was loved and revered for her service. Luckily, everyone had read Aesop’s fables, and no one tried to kill Day-Lewis to get all those extra eggs out. Still Utopia did pay a few armed guards to keep watch for the illiterates, just in case. Utopia wasn’t into storing wealth because it wanted to run some important social programs to improve the education and health of the country. Thankfully they didn’t run a deficit and issue bonds so we don’t need to get into any political arguments about libertarianism. This article is about golden eggs. Utopia employed the service of bunny Fred to take the golden eggs to the nearby country of Capitalism in return for services of education and health. Every day, bunny Fred took 10 eggs out of the country. Every day, goose Day-Lewis produced 10 eggs. It was a perfect balance. The law of conservation of golden eggs was intact. Thankfully, history does not record any comment on the value of the services received for these eggs, or on the benefit to society of those services, so we can focus on the eggs story. Due to external circumstances outside of Utopia’s control, on January 1st, the year of Our Goose 150, a new international boundary was created between Utopia and Capitalism. History does not record the complex machinations behind the reasons for this new border control. However, as always with government organizations, things never go according to plan. On the first day, January 1st, there were paperwork issues. Bunny Fred showed up with 10 golden eggs, and, what he thought was the correct paperwork. Nothing got through. Luckily, unlike some government organizations with wafer-thin protections for citizens’ rights, they didn’t practice asset forfeiture for “possible criminal activity we might dream up and until you can prove you earned this honestly we are going to take it and never give it back”. Instead they told Fred to come back tomorrow. On January 2nd, Bunny Fred had another run at the problem and brought another 10 eggs. The export paperwork for the supply of education and health only allowed for 10 golden eggs to be exported to Capitalism so border control sent on the 10 eggs from Jan 1st and insisted Bunny Fred take 10 eggs take back to Utopia. On January 3rd, Bunny Fred, desperate to remedy the deficit of services in Utopia took 20 eggs – 10 from Day-Lewis and 10 he had brought back from border control the day before. Insistent on following their new ad hoc processes, border control could only send on 10 eggs to Capitalism. As they had no approved paperwork for “storing” extra eggs, they insisted that Fred take back the excess eggs. Heretics! This is impossible. Day-Lewis, last of the gold-laying geese, only produces 10 eggs per day. How can Bunny Fred be taking 20 eggs to border control? You can’t create golden eggs! The law of conservation of golden eggs has been violated. You can’t get more than 100% efficiency. This is impossible. Do Trenberth and Kiehl understand the First Law of Thermodynamics? & Part Two & Part Three – The Creation of Energy? The atmosphere cools to space by radiation. Well, without getting into all the details, the surface cools to space as well by radiation but not much radiation is emitted by the surface that escapes directly to space (note 1). Most surface radiation is absorbed by the atmosphere. And of course the surface mostly cools by convection into the troposphere (lower atmosphere). If there were no radiatively-active gases (aka “GHG”s) in the atmosphere then the atmosphere couldn’t cool to space at all. Technically, the emissivity of the atmosphere would be zero. Emission is determined by the local temperature of the atmosphere and its emissivity. Wavelength by wavelength emissivity is equal to absorptivity, another technical term, which says what proportion of radiation is absorbed by the atmosphere. If the atmosphere can’t emit, it can’t absorb (note 2). So as you increase the GHGs in the atmosphere you increase its ability to cool to space. A lot of people realize this at some point during their climate science journey and finally realize how they have been duped by climate science all along! It’s irrefutable – more GHGs more cooling to space, more GHGs mean less global warming! Ok, it’s true. Now the game’s up, I’ll pack up Science of Doom into a crate and start writing about something else. Maybe cognitive dissonance..
Halfway through boxing everything up I realized there was a little complication to the simplicity of that paragraph. The atmosphere with more GHGs has a higher emissivity, but also a higher absorptivity. 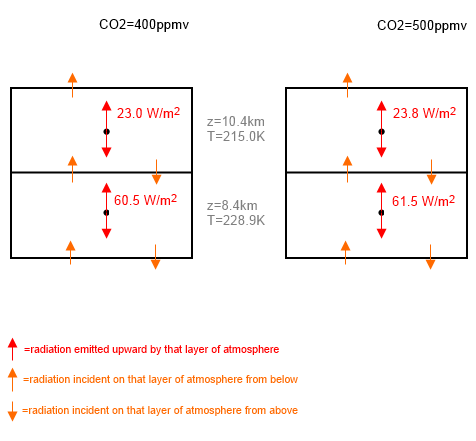 It’s clear that the two layers are both emitting more radiation with more CO2.More cooling to space. For interest, the “total emissivity” of the top layer is 0.190 in the first case and 0.197 in the second case. The layer below has 0.389 and 0.395. The key point is that the OLR (outgoing longwave radiation) is lower in the case with more CO2. Yet each layer is emitting more radiation. How can this be? Take a look at the radiation entering the top layer on the left = 265.1, and add to that the emitted radiation = 23.0 – the total is 288.1. Now subtract the radiation leaving through the top boundary = 257.0 and we get the radiation absorbed in the layer. This is 31.1 W/m². Compare that with the same calculation with more CO2 – the absorption is 32.2 W/m². This is the case all the way up through the atmosphere – each layer emits more because its emissivity has increased, but it also absorbs more because its absorptivity has increased by the same amount. So more cooling to space, but unfortunately more absorption of the radiation below – two competing terms. So why don’t they cancel out? Emission of radiation is a result of local temperature and emissivity. Absorption of radiation is the result of the incident radiation and absorptivity. 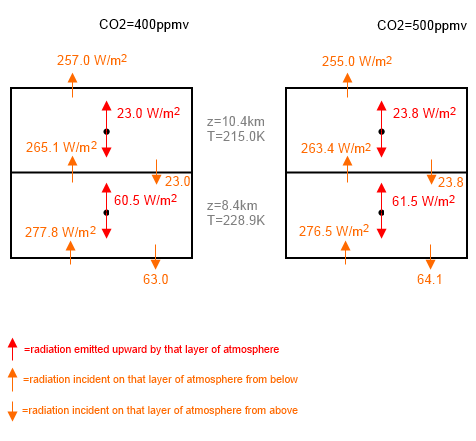 Incident upwards radiation started lower in the atmosphere where it is hotter. So absorption changes always outweigh emission changes (note 4). If it’s still not making sense then think about what happens as you reduce the GHGs in the atmosphere. The atmosphere emits less but absorbs even less of the radiation from below. So the outgoing longwave radiation increases. More surface radiation is making it to the top of atmosphere without being absorbed. So there is less cooling to space from the atmosphere, but more cooling to space from the surface and the atmosphere. If you add lagging to a pipe, the temperature of the pipe increases (assuming of course it is “internally” heated with hot water). And yet, the pipe cools to the surrounding room via the lagging! Does that mean more lagging, more cooling? No, it’s just the transfer mechanism for getting the heat out. That was just an analogy. Analogies don’t prove anything. If well chosen, they can be useful in illustrating problems. End of analogy disclaimer. If you want to understand more about how radiation travels through the atmosphere and how GHG changes affect this journey, take a look at the series Visualizing Atmospheric Radiation. Note 2: A very basic point – absolutely essential for understanding anything at all about climate science – is that the absorptivity of the atmosphere can be (and is) totally different from its emissivity when you are considering different wavelengths. The atmosphere is quite transparent to solar radiation, but quite opaque to terrestrial radiation – because they are at different wavelengths. 99% of solar radiation is at wavelengths less than 4 μm, and 99% of terrestrial radiation is at wavelengths greater than 4 μm. That’s because the sun’s surface is around 6000K while the earth’s surface is around 290K. So the atmosphere has low absorptivity of solar radiation (<4 μm) but high emissivity of terrestrial radiation. Note 3: Any numerical calculation has to create some kind of grid. This is a very course grid, with 10 layers of roughly equal pressure in the atmosphere from the surface to 200mbar. The grid assumes there is just one temperature for each layer. Of course the temperature is decreasing as you go up. We could divide the atmosphere into 30 layers instead. We would get more accurate results. We would find the same effect. 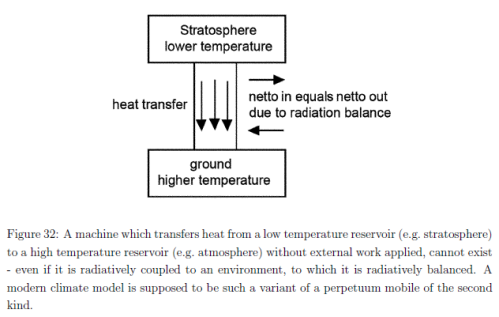 Note 4: The equations for radiative transfer are found in Atmospheric Radiation and the “Greenhouse” Effect – Part Six – The Equations. The equations prove this effect. In A Challenge for Bryan I put up a simple heat transfer problem and asked for the equations. Bryan elected not to provide these equations. So I provide the answer, but also attempt some enlightenment for people who don’t think the answer can be correct. As DeWitt Payne noted, a post with a similar problem posted on Wattsupwiththat managed to gather some (unintentionally) hilarious comments. Spherical body, A, of radius ra, with an emissivity, εa =1. The sphere is in the vacuum of space. It is internally heated by a mystery power source (let’s say nuclear, but it doesn’t matter), with power input = P.
The sphere radiates into deep space, let’s say the temperature of deep space = 0K to make the maths simpler. 1. What is the equation for the equilibrium surface temperature of the sphere, Ta? The condition of case A, but now body A is surrounded by a slightly larger spherical shell, B, which of course is itself now surrounded by deep space at 0K. B has a radius rb, with an emissivity, εb =1. This shell is highly conductive and very thin. 2a. What is the equation for the new equilibrium surface temperature, Ta’? 2b. What is the equation for the equilibrium temperature, Tb, of shell B? The reason for the “slightly larger shell” is to avoid “complex” view factor issues. Of course, I’m happy to relax the requirement for “slightly larger” and let Bryan provide the more general answer. The reason for the “highly conductive” and “thin” outer shell, B, is to avoid any temperature difference between the inside and the outside surfaces of the shell. That is, we can assume the outside surface is at the same temperature as the inside surface – both at temperature, Tb. This kind of problem is a staple of introductory heat transfer. This is a “find the equilibrium” problem. How do we solve these kinds of problems? It’s pretty easy once you understand the tools. The first tool is the first law of thermodynamics. Steady state means temperatures have stabilized and so energy in = energy out. We draw a “boundary” around each body and apply the “boundary condition” of the first law. The second tool is the set of equations that govern the movement of energy. These are the equations for conduction, convection and radiation. In this case we just have radiation to consider. For people who see the solution, shake their heads and say, this can’t be, stay on to the end and I will try and shed some light on possible conceptual problems. Of course, if it’s wrong, you should easily be able to provide the correct equations – or even if you can’t write equations you should be able to explain the flaw in the formulation of the equation. In the original article I put some numbers down – “For anyone who wants to visualize some numbers: ra=1m, P=1000W, rb=1.01m“. I will use these to calculate an answer from the equations. I realize many readers aren’t comfortable with equations and so the answers will help illuminate the meaning of the equations. I go through the equations in tedious detail, again for people who would like to follow the maths but don’t find maths easy. Energy in, Ein = Energy out, Eout : in Watts (Joules per second). Now we haven’t said anything about how long it takes to reach this temperature. We don’t have enough information for that. That’s the nice thing about steady state calculations, they are easier than dynamic calculations. We will look at that at the end. Probably everyone is happy with this equation. Energy is conserved. No surprises and nothing controversial. Now we will apply the exact same approach to the second case. First we consider “body A”. Given that it is enclosed by another “body” – the shell B – we have to consider any energy being transferred by radiation from B to A. If it turns out to be zero, of course it won’t affect the temperature of body A.
Ein(a) = P + Eb-a …. [eqn 4], where Eb-a is a value we don’t yet know. It is the radiation from B absorbed by A. – we will look at shell B and come back to the last term in eqn 4. Using the numbers given, Ta = 1.2 Tb. 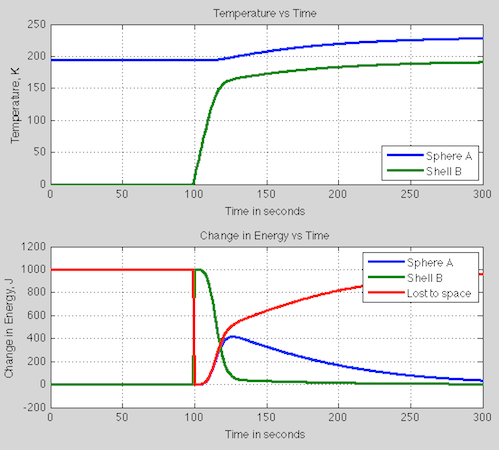 So the sphere is 20% warmer than the shell (actually 2 to the power 1/4). We need to use Ein=Eout for the sphere A to be able to get the full solution. We wrote down: Ein(a) = P + Eb-a …. [eqn 4]. Now we know “Eb-a” – this is one of the terms in eqn 7. T’a = [P / (2πra²σ)]1/4 …. [eqn 10] – I added a dash to Ta so we can compare it with the original value before the shell arrived. T’a = 21/4 Ta …. [eqn 11] – that is, the temperature of the sphere A is about 20% warmer in case 2 compared with case 1. In case 2, the inner sphere, A, has its temperature increase by 36K even though the same energy production takes place inside. Obviously, this can’t be right because we have created energy??.. let’s come back to that shortly. Notice something very important – Tb in case 2 is almost identical to Ta in case 1. The difference is actually only due to the slight difference in surface area. Why? The system has an energy production, P, in both cases. Now let’s confirm the mystery unphysical totally fake invented energy. Let’s compare the flux emitted from A in case 1 and case 2. I’ll call it R.
This is obviously rubbish. The same energy source inside the sphere and we doubled the sphere’s energy production!!! Get this idiot to take down this post, he has no idea what he is writing.. Yet if we check the energy balance we find that 80 W/m² is being “created” by our power source, and the “extra mystery” energy of 79 W/m² is coming from our outer shell. In any given second no energy is created. When we snapped the outer shell over the sphere we made it harder for heat to get out of the system. Energy in = energy out, in steady state. When we are not in steady state: energy in – energy out = energy retained. Energy retained is internal energy which is manifested as temperature. We made it hard for heat to get out, which accumulated energy, which increased temperature.. until finally the inner sphere A was hot enough for all of the internally generated energy, P, to get out of the system. Let’s add some information about the system: the heat capacity of the sphere = 1000 J/K; the heat capacity of the shell = 100 J/K. It doesn’t much matter what they are, it’s just to calculate the transients. We snap the shell – originally at 0K – around the sphere at time t=100 seconds and see what happens. At 100 seconds we see that instead of our steady state 1000W leaving the system, instead 0W leaves the system. This is the important part of the mystery energy puzzle. We put a 0K shell around the sphere. This absorbs all the energy from the sphere. At time t=100s the shell is still at 0K so it emits 0W/m². It heats up pretty quickly, but remember that emission of radiation is not linear with temperature so you don’t see a linear relationship between the temperature of shell B and the energy leaving to space. For example at 100K, the outward emission is 6 W/m², at 150K it is 29 W/m² and at its final temperature of 193K, it is 79 W/m² (=1000 W in total). As the shell heats up it emits more and more radiation inwards, heating up the sphere A. The mystery energy has been revealed. The addition of a radiation barrier stopped energy leaving, which stored heat. The way equilibrium is finally restored is due to the temperature increase of the sphere. All we have done here is used conservation of energy and the Stefan Boltzmann law of emission of thermal radiation. Bryan needs no introduction on this blog, but if we were to introduce him it would be as the fearless champion of Gerlich and Tscheuschner. Bryan has been trying to teach me some basics on heat transfer from the Ladybird Book of Thermodynamics. In hilarious fashion we both already agree on that particular point. So now here is a problem for Bryan to solve. Of course, in Game of Thrones fashion, Bryan can nominate his own champion to solve the problem. This problem takes a couple of minutes to solve on a piece of paper. I suspect we will wait a decade for Bryan’s answer. But I love to be proved wrong! In The “Greenhouse” Effect Explained in Simple Terms I list, and briefly explain, the main items that create the “greenhouse” effect. I also explain why more CO2 (and other GHGs) will, all other things remaining equal, increase the surface temperature. I recommend that article as the place to go for the straightforward explanation of the “greenhouse” effect. It also highlights that the radiative balance higher up in the troposphere is the most important component of the “greenhouse” effect. However, someone recently commented on my first Kramm & Dlugi article and said I was “plainly wrong”. 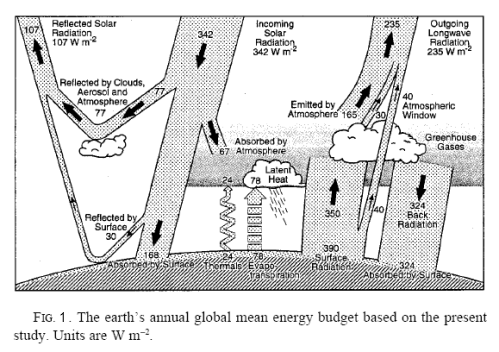 Kramm & Dlugi were in complete agreement with Gerlich and Tscheuschner because they both claim the “purported greenhouse effect simply doesn’t exist in the real world”. If it’s just about flying a flag or wearing a football jersey then I couldn’t agree more. However, science does rely on tedious detail and “facts” rather than football jerseys. As I pointed out in New Theory Proves AGW Wrong! two contradictory theories don’t add up to two theories making the same case.. In the case of the first Kramm & Dlugi article I highlighted one point only. It wasn’t their main point. It wasn’t their minor point. They weren’t even making a point of it at all. Many people believe the “greenhouse” effect violates the second law of thermodynamics, these are herein called “the illuminati”. Kramm & Dlugi’s equation demonstrates that the illuminati are wrong. I thought this was worth pointing out. The “illuminati” don’t understand entropy, can’t provide an equation for entropy, or even demonstrate the flaw in the simplest example of why the greenhouse effect is not in violation of the second law of thermodynamics. Therefore, it is necessary to highlight the (published) disagreement between celebrated champions of the illuminati – even if their demonstration of the disagreement was unintentional. It’s difficult to know how to criticize an imaginary diagram. We could, for example, point out that it is imaginary. But that would be picky. We could say that no one draws this diagram in atmospheric physics. That should be sufficient. But as so many of the illuminati have learnt their application of the second law of thermodynamics to the atmosphere from this fictitious diagram I feel the need to press forward a little. This is the actual textbook, before the Gerlich manoeuvre as I would like to describe it. 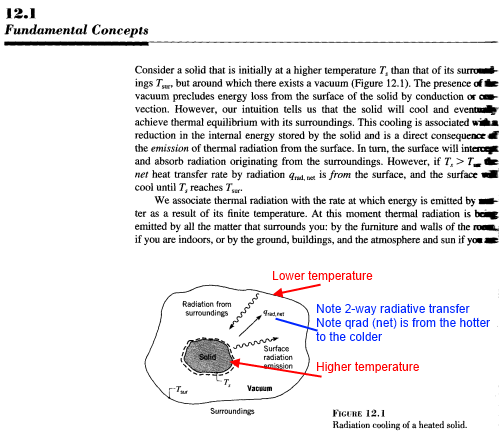 We can see in the diagram and in the text that radiation travels both ways and there is a net transfer which is from the hotter to the colder. The term “net” is not really capable of being confused. It means one minus the other, “x-y”. Not “x”. (For extracts from six heat transfer textbooks and their equations read Amazing Things we Find in Textbooks – The Real Second Law of Thermodynamics). So hopefully that’s clear. Proof by parody. This is “now” a perpetual motion machine and so heat transfer textbooks are wrong. All of them. Somehow. It should be clear that the radiation from the hotter surface is higher than the radiation from the colder atmosphere. If anyone wants this explained, please ask. I could apply the Gerlich manoeuvre to this diagram but they’ve already done that in their paper (as shown above in figure 1). The equation says, the sum of all fluxes – at one point on the surface = 0. This is an application of the famous first law of thermodynamics, that is, energy cannot be created or destroyed. The red term – absorbed atmospheric radiation – is the radiation from the colder atmosphere absorbed by the hotter surface. This is also known as “DLR” or “downward longwave radiation, and as “back-radiation”. Now, let’s assume that the atmospheric radiation increases in intensity over a small period. What happens? The only way this equation can continue to be true is for one or more of the last 4 terms to increase. So, when atmospheric radiation increases the surface temperature must increase (or amazingly the humidity differential spontaneously increases to balance, but without a surface temperature change). According to G&T and the illuminati this surface temperature increase is impossible. According to Kramm & Dlugi, this is inevitable. Or even, which one of the above is wrong. That would be outstanding. Of course, I know they won’t do that – even though I’m certain they believe all of the above points. (Likewise, Kramm & Dlugi won’t answer the question I have posed of them). Hopefully, the illuminati can contact Kramm & Dlugi and explain to them where they went wrong. I have my doubts that any of the illuminati have grasped the first law of thermodynamics or the equation for temperature change and heat capacity, but who could say.